In your Android device, press the app icon to launch the app. The Login screen displays, prompting you to enter your login credentials. In the Host field, enter the host name of the system (for example, syncedtool.com). In the User field, enter your username (for example, user@mail.com). Press the Sign in button when you are finished. 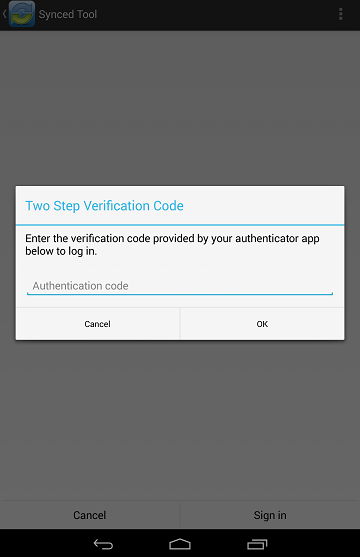 If Two-Step Authentication has been enabled as an organization policy or as an account policy, you will be prompted to enter an authentication code at the time of initial registration. Enter the authentication code and press the OK button. If Two-Step Authentication has been enabled as an organization policy, you will also be asked to configure a PIN after the initial registration process. Note: If Two-Step Authentication has been turned on only as an individual account policy, that account will not be required to configure a passcode. You will be directed to the Settings page. Select Require PIN. You will be prompted to enter a PIN. When accessing the mobile app in the future, you will be prompted to first enter this PIN. When you have access to your account, you can use the app to open, view, and manage content. Press the My Files link to view and manage your files and folders; you can rename, move, or pin an item for offline viewing. Press the Recent Files link to view your most recent files. Press the Offline Files link to view a list of pinned files that can be viewed offline. Press the Backups link to view a list of your backups. You can view files using the Web Preview tool, which gives you the ability to preview content without fully downloading it to your mobile device. 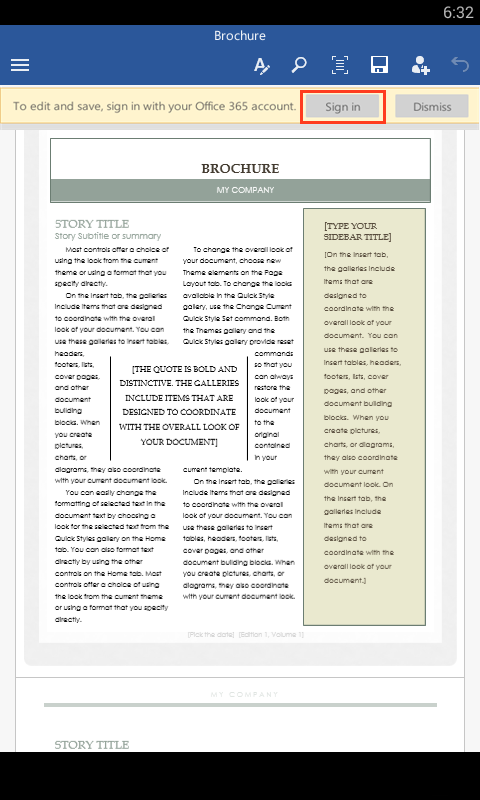 In this way, you can review content without utilizing mobile resources. Press the My Files link. The My Files screen displays. In the My Files screen, find the file that you want to view. The file opens in the Web Preview tool, allowing you to review content without utilizing mobile resources. Optionally, you can lock a file or folder. Locked files and folders will be honored across all linked devices. 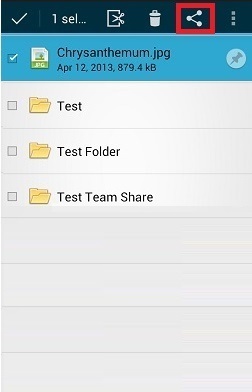 In the My Files screen, select the file or folder within the Team Share that you want to lock. In the top right-hand corner of the screen, press the more options button, and then press the Lock link. The file is now locked. To edit content in your mobile app, you must first install a third-party editing tool. To edit content in your mobile app, you must first install a third-party editing tool. These instructions refer to Microsoft mobile apps (Microsoft Word app, Microsoft Excel app, and Microsoft PowerPoint app). You can download these tools at no cost. To use these tools for editing purposes, you must first create a free Office 365 account. 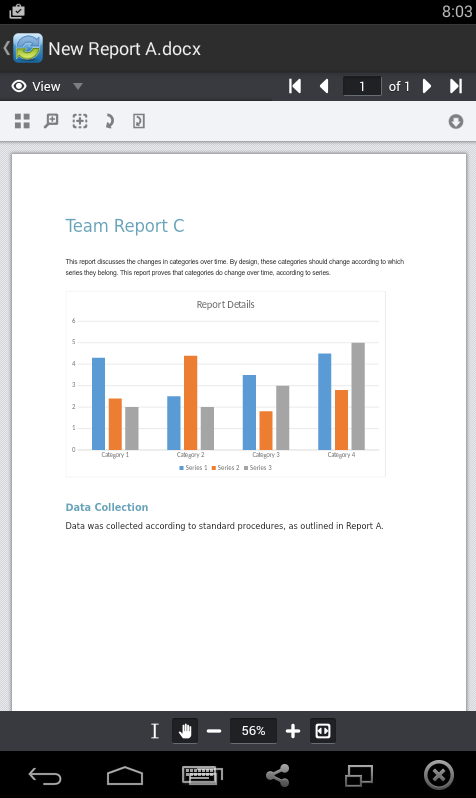 Download the Microsoft Word app, Microsoft Excel app, or the Microsoft PowerPoint app, depending on your needs and preferences. With the Microsoft app installed, press the appropriate file that you want to edit. The file will open in the Microsoft app, and will prompt you to sign in to your Office 365 account, if you are not already signed in. Press the Sign In button. 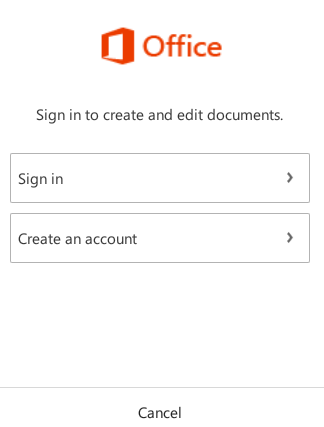 The Office 365 Sign In page displays, asking you to either sign in or create a new account. 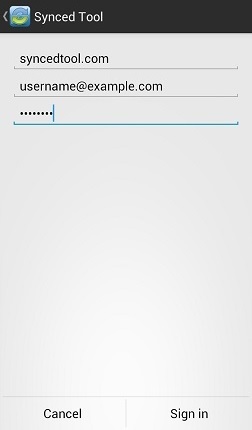 When you are finished signing in, the file will display in the Microsoft app. Use the toolbar to edit the file as appropriate. Save your file when you are finished. The file will synchronize immediately. 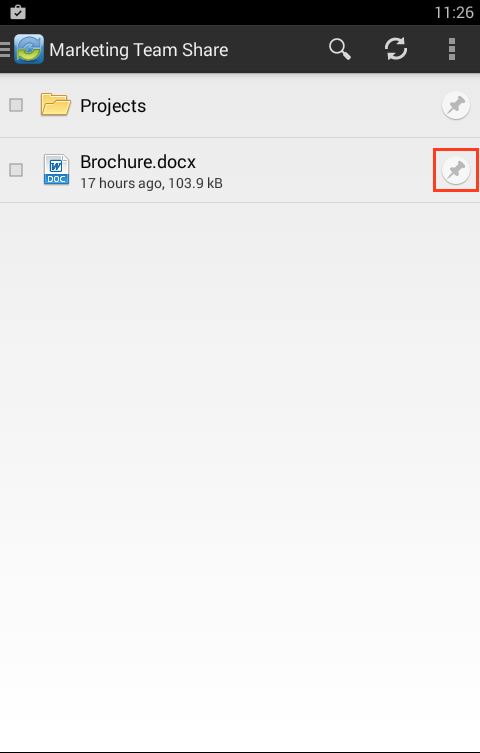 In the My Files screen, select the file or folder that you want to share, and press the Share button. In the Choose a share type window, select Public share to send a standard share. 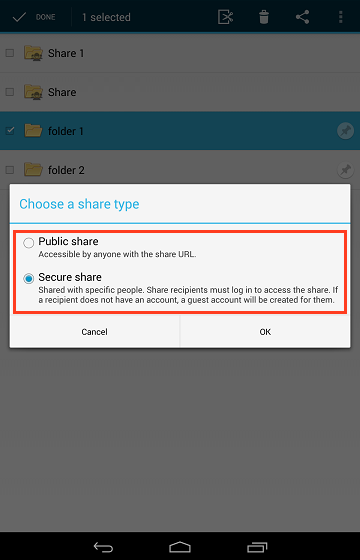 Alternatively, select Secure share to send a secure share, which will require the recipient to log in before he or she can access the shared item. Press OK to confirm your selection. Note: If your administrator has configured settings to only allow secure shares, you will only have the option to send a secure share. 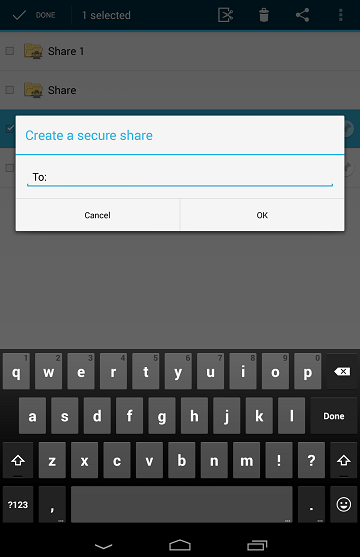 In the Create a secure share window, enter your recipient's email address and press the OK button. Your item will be shared with the specified recipient. 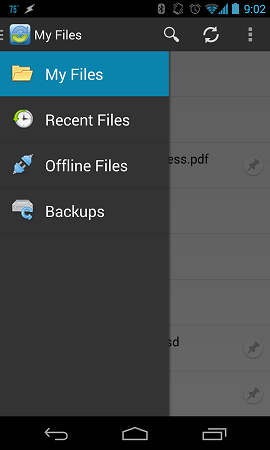 You can also automatically back up your mobile phone's camera gallery to a synced folder using the Auto Backup feature. When this feature is turned on, your mobile app will automatically back up photos, videos, or both, to a synced folder called Camera Uploads. 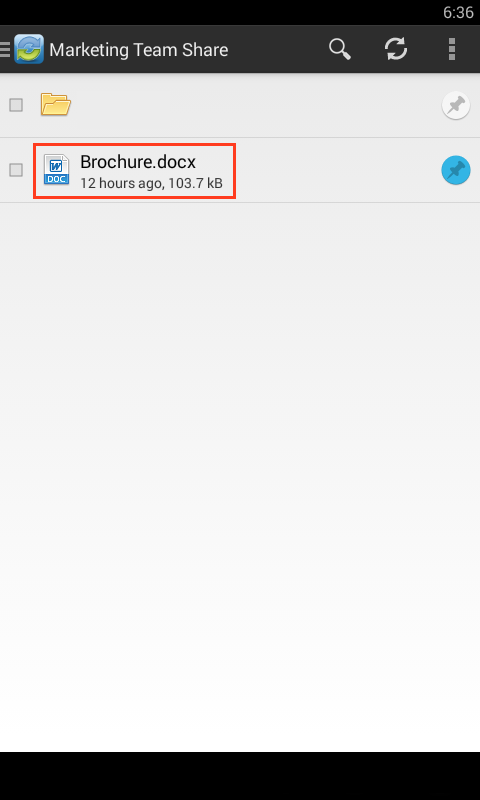 With this feature, you always have a backup of your mobile photos and videos. In the Settings page, press the Enable Auto Backup option. Press the Settings button. The Settings page displays. Select Never if you don't want to back up your photos. Select Over Wi-Fi Only to back up photos only when you are connected to Wi-Fi. Select Over Wi-Fi or Mobile Network to back up your photos whether you are connected to Wi-Fi or on your mobile network. Please note that uploading over your mobile network will use your data connection, and charges from your service provider may apply. Select Never if you don't want to back up your videos. Select Over Wi-Fi Only to back up videos only when you are connected to Wi-Fi. Select Over Wi-Fi or Mobile Network to back up your videos whether you are connected to Wi-Fi or on your mobile network. Please note that uploading over your mobile network will use your data connection, and charges from your service provider may apply. Press Back Up Now if you want to back up your photos and videos immediately, if allowed by your connection settings configured above. Finally, you can pin files so that they are downloaded to your device. Your mobile app will be aware of unpinned files, but only pinned files will be fully downloaded. You can decide to pin and unpin files based on space limitations and access needs. 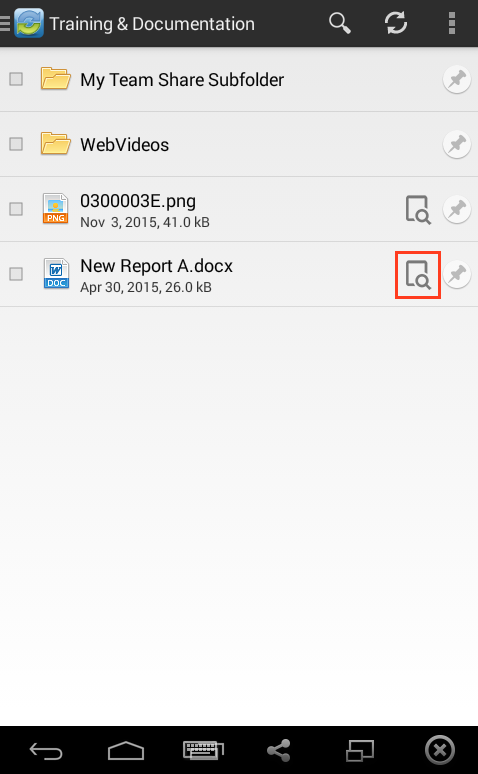 In the My Files screen, select the Pin button next to the file or folder that you want to download to your device. If you pin a folder, all if its files will be pinned as well. 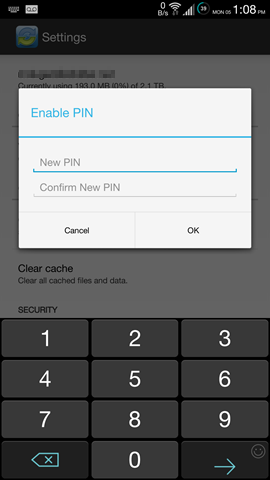 When you unpin a file, it will remain on your mobile device until your cache is cleared. 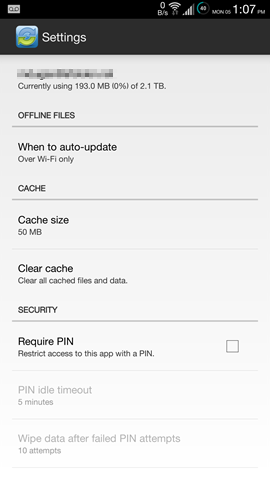 You can manually clear your cache through the Settings screen.